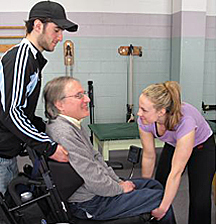 This program provides a high quality, individualized exercise program for people with multiple sclerosis. Participants receive one-on-one assistance from OSU graduate students who are studying improved health for people with disabilities in the Adapted Physical Activity program. We work with each participant to develop an appropriate exercise program that will contribute to maintaining and improving functional performance and independence. Exercise is one aspect of an appropriate health plan, and many other factors contribute to optimal health when you have multiple sclerosis. Your doctor can provide guidance on diet and other aspects of your health plan. I have learned about MS on both a scientific and personal level. These amazing people have taught me about patience (mine) and diligence (theirs)! The Multiple Sclerosis Exercise Program focuses on increasing your independence and functional mobility. A well-rounded exercise program focusing on health outcomes will be developed based on each participant’s interests, abilities, and needs as determined by initial analyses and referral information. The program is open to all people with multiple sclerosis. 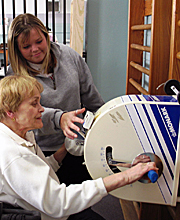 A medical release from your doctor is required to participate in the program. The human contact, the touch, is so important. The exercise helps maintain muscle and joint flexibility – and improve my physical and mental health. Participants pay a nominal fee to cover parking and program costs. Payment is dependent on ability to pay. Developed in 1999, the Multiple Sclerosis Exercise Program is directed by JoonKoo (JK) Yun, Professor in the School of Biological and Population Health Sciences. Graduate student Byung Mo Ku in the Adapted Physical Activity program provide directs supervision for program participants. When I was diagnosed, I learned that building core strength would be critical to deal with the effects of MS. Finding out that this class was available really gave me a positive boost – the exercise helps me keep physically strong and stay positive. The individual attention I receive is essential for regular, positive exercise. Program information and registration and consent forms will be forwarded by mail upon request. Oregon State University is an Affirmative Action/Equal Opportunity Employer and complies with Section 504 of the Rehabilitation Act. We experience the progress together... small steps are cause for big celebrations!